Allendale, Alpine, Bergenfield, Bogota, Closter, Demarest, Dumont, Emerson, Fair Lawn, Franklin Lakes, Glen Rock, Hackensack, Harrington Park, Haworth, Hillsdale, Ho-Ho-Kus, Lodi, Mahwah, Maywood, Midland Park, Montvale, New Milford, Northvale, Norwood, Oakland, Old Tappan, Oradell, Paramus, Park Ridge, Ramsey, Ridgewood, River Edge, River Vale, Rochelle Park, Rockleigh, Saddle River, part of Teaneck, Upper Saddle River, Waldwick, Washington Township, Westwood, Woodcliff Lake, and Wyckoff. Andover Borough, Andover Township, Branchville, Frankford, Franklin, Fredon, Green, Hamburg, Hampton, Hardyston, Lafayette, Montague, Newton, Sandyston, Stillwater, Sussex Borough, Vernon, Walpack, and Wantage. 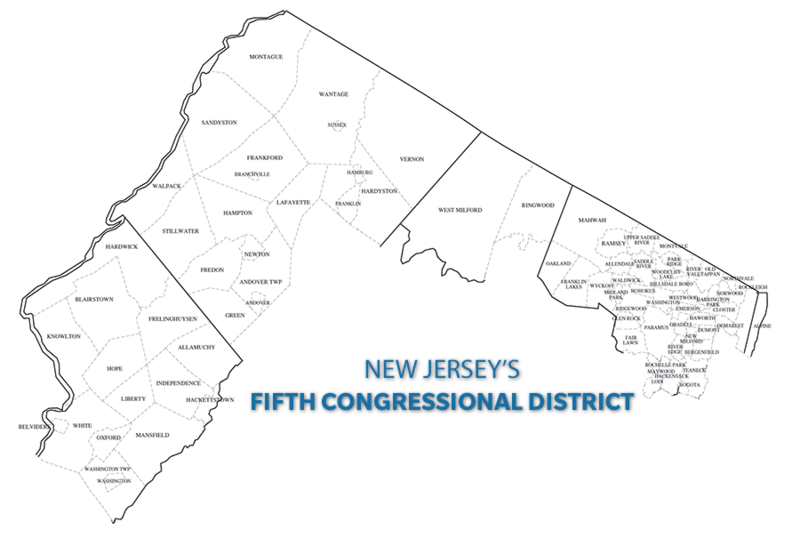 Allamuchy, Belvidere, Blairstown, Frelinghuysen, Hackettstown, Hardwick, Hope, Independence, Knowlton, Mansfield, Oxford, Washington Borough, Washington Township, and White Township.